The goal of the Res-AGorA project is to create a governance framework for Responsible Research and Innovation (RRI) that secures a commitment within research and innovation towards solving major social and environmental challenges that our societies face. Science, research and innovation are integral elements of modern societies, and society increasingly expects them to address the key challenges of the future – such as health and wellbeing, sustainability, or climate change. While science and technology potentially provide solutions, they are usually accompanied by uncertainties, unanticipated consequences and controversy. Hence, Responsible Research and Innovation – RRI – has been introduced as an approach which aims to improve the alignment between research and innovation on the one hand and societal demands and moral values on the other. 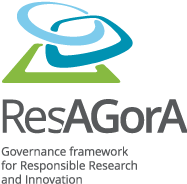 The goal of the Res-AGorA project is to develop a comprehensive governance framework for RRI. This will be achieved through extensive research about existing RRI governance across different scientific technological areas, continuous monitoring of RRI trends and developments in selected countries, and constructive negotiations and deliberation between key stakeholders. This comprehensive empirical work will be the building blocks of the creation of a governance framework for RRI. Res-AGorA consists of eight European partners from universities, research institutes and offices for science and technology. The project is coordinated by the Fraunhofer Institute for Systems and Innovation Research ISI, one of the leading innovation research institutes in Europe. The project is funded within FP7 Science in Society and runs from 2013 – 2016. Visit the RES-AGORA website (external link, last accessed 28 March 2014).